One must wonder if someone at Paramount has an old score to settle with Eddie Murphy, because the release of Norbit in the weeks leading up to this February’s Oscar ceremony is nothing short of the dirtiest possible means of potentially upsetting the man’s chances of recognition for his work in Dreamgirls. Not having seen the performance, I can’t attest to its caliber, but it’s surely not one to be aided by the embarrassing television spots circulating the airwaves for this return to the gluttonous form of his Nutty Professor films. However, despite the rankness put forth by its advertising campaign, Norbit isn’t all that bad (or that good, either), in large part because it doesn’t front. In many ways, the film owns up to the rampant racism and cruel mockery of those more prone to the effects of gravity that make up the bulk of its jokes, exposing its characters’ own shortsightedness as an inherent part of the humor. You’ll find no sheep’s clothing here. Unfortunately, the more it strains for laughs, the more Norbit makes one long for its star’s once glorious days on SNL (“Merry Christmas, dammit!”). Indeed, the title character—an adult Steve Urkel type who finds himself married to an unfaithful and abusive spouse—is an affecting creation that, above all else, deserves to be surrounded with better material. 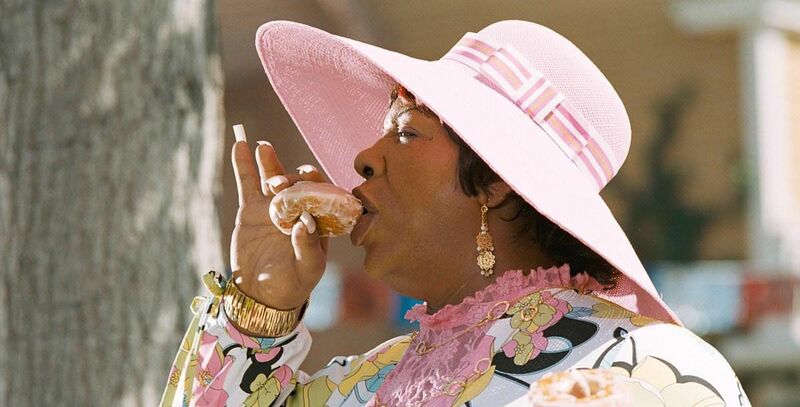 Murphy brings a surprising amount of humanity to Norbit’s otherwise thin personality, and it’s not at all difficult to imagine the character in a better film. Despite occasionally employing its lowbrow comedy antics in a way that reveals meaningful human relationships beneath the silliness of it all, the film is depressingly one-note, as the mawkish but untempered story of Norbit gaining the self-confidence necessary to assert his individual rights is weighed down by scattershot jokes focused on his wife Rasputia’s (also Murphy) horrific weight problem and exaggerated ghetto mannerisms, settling for knee-jerk physical sensibilities when far greater levels of terrific absurdity are already within sight of the film’s established parameters. Indeed, for as base as Norbit‘s pleasures remain, it’s most discouraging to see the filmmakers setting such low standards for themselves. A film like Anchorman turns everyday scenarios upside down and then runs for a touchdown; here, the jokes stop short at basic perversion.